Unpleasant as it may seem moths are the common, creepy and persistent little vermin feasting on your clothes. Yes, you need to get rid of them this instant, but you won’t unless you find their kryptonite and prevent them from cosying up in your closet or wardrobe. To find their weak spot, you need to know your cheeky enemy. There are a few basic questions which will help you kick the moths out of your property… Unless the infestation has grown into a household plague, destroying every textile fibre in their way. Well, the short and simplest answer is “a lot”. They’re as many as 160, 000 which compared to the number of butterflies is very impressive. Yet, only a few moths are known to be domestic terrorists. What Types Of Moths Eat Clothes? There are 5 moth species which can terrorize your household. Do all moths eat clothes? The short answer is “no”. Some of them are a little bit picky when it comes to food preferences and some would eat anything from oatmeal to carpet fibres. The shortlists of clothes destroyers include: Brown House Moth (Hofmannophila pseudospretella), Common Clothes Moth (Tineola bisselliella), Case-bearing Clothes Moth (Tinea pellionella). As we mentioned above, different moth species have a different diet. Brown House Moth and the White-Shouldered Moths prefer human food like cereal, dried fruits, oatmeal, and some textiles like wool and carpet fibres. Case-Bearing Moths have a more sophisticated palate, as they fancy munching on fibrous keratin, animal fur, hairs and feathers. 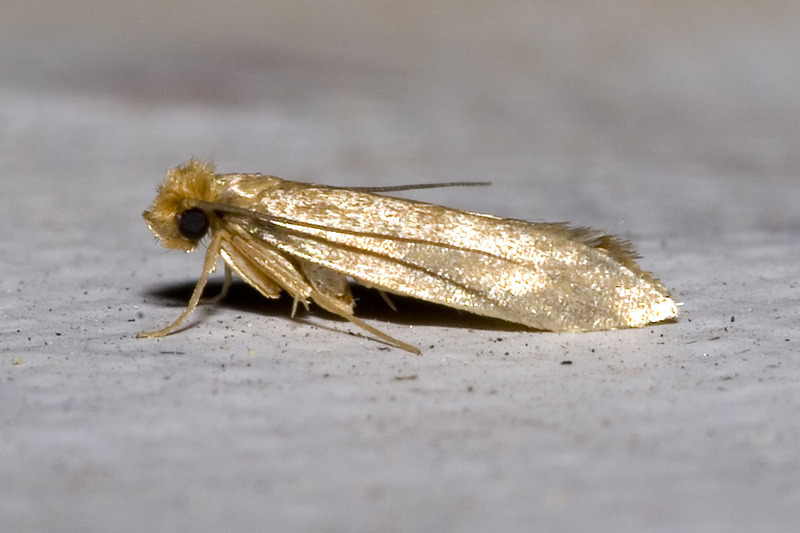 The Common Clothes Moth has a similar taste which includes wool, carpets, upholstery and animal fur, as well. How Do Moths Get In Your Home? Where Do Moths Live In A House? Similarly to vampires, these little textile fibre destroyers detest daylight. Although you’d think to pull the curtains and let sunlight in your home, remember they might hide in the darker corners of your wardrobe. Domestic moths are not interested in your flesh just as other wild species. You might get a rash-like trail from wild moths’ spurs on their legs, but nothing more. A client of ours asked us “If they don’t bite people how can they cause any allergic reactions?!”. The answer lies in their wings. They’re not called Lepidoptera just like that. Their wings are covered in tiny scales which fall off when they come in contact with other objects and become an airborne allergen. This is not the only way they can cause allergic reactions – their faecal matter and direct contact can do the same as their scales, as well. Be on the look out for signs of a moth infestation so you can prevent it ASAP. The venom spreads into the whole body pretty quickly and other organs like kidneys and lungs get affected pretty quickly. In this case, an anti-venom should be given to the sick person immediately. How To Get Rid Of Moths At Home? We could give you a short to-do list which consists of ordinary household tasks. Change vacuum cleaner bags as often, as you can. This way you will rid yourself of any eggs and larvae left. Wash all types of fabrics like linen, towels, furnishings and similar where moths could choose as their incubator. Use different scents to repel them. We exclude the dreadful smell of mothballs, which could deter you, as well. Using different scents which repel moths is a natural moth control. Yet, most people are not aware of other places these little nocturnal beasts might be hiding. This way homeowners let a mild infestation become something even more serious and in moments like these, moth fumigation is obligatory.